Hawkers will soon sell their wares in specific areas of Nairobi county under a licensing bill. Hawkers have been called a menace, jamming the streets and committing crimes. In October 2017 Governor Mike Sonko announced that hawkers will be only allowed to operate within the city centre from 2pm. But that hasn't worked. The Nairobi City County Trade Licensing Bill 2018 contains a new clause which seeks to license hawkers and street vendors. The bill, in its third reading in the county assembly, says the Directorate of Trade Licensing will be in charge of issuing licenses. If passed, hawkers will be required to produce their licenses at all times on demand for inspection by enforcement officers. 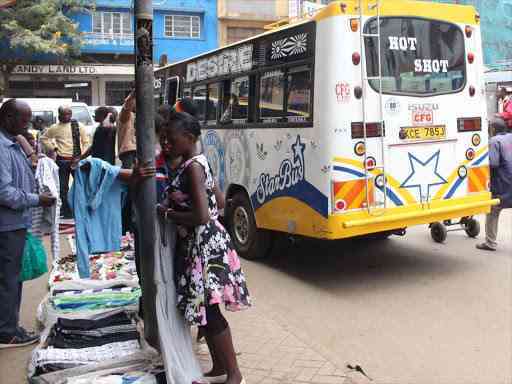 After getting licenses, hawkers within the Central Business District will be required to pay Sh500 per month. while those outside CBD will pay Sh30 daily. Hawkers operating with vehicles will be required to pay an annual fee of Sh15,000. Those without vehicles will Sh7,500. The current annual fee is Sh5,000. Small informal sector traders like street vendors, shoe shiners and cleaners will still pay the county Sh2,500 annually. The current annual fee is Sh5,000. No hawker's license will be required of anyone acting as a hawker of goods and services allowed by the Directorate of Trade Licensing to be hawked without a license, the bill reads. Trade committee chairman Charles Thuo said the plan to license the hawkers has been under discussion for a long time. "We had planned with the national government to license the traders as we introduce the car-free parking days in the CBD. The licences will help us identify who is in their rightful place of operation. This will also help restore order in the city," Thuo told the Star yesterday. He said licensing will be the last step once designated streets have been identified. The license will disclose the type of goods that may be hawked, the area where hawking shall be restricted and the hours during when goods may be hawked, among other information. Hawkers have been a menace which has never been solved even after Nairobi Governor Mike Sonko's administration came to power in 2017. Residents have raised concerns about the capital's streets being flooded by hawkers. .They take over pedestrian paths, leaving no option but for people to walk in the roads. “To ensure a harmonious relationship between the city-county and the hawkers, there will be no hawking in front of shops before 2pm, no hawking on both sides of the road. The paths are available for pedestrians and no hawking beyond Tom Mboya Street,” Sonko said. It has been a cat-and-mouse chase between the CBD hawkers and the city inspectorate officers who are responsible for keeping them off the streets. Both parties have accused each other of harassment and violence. In November 2017, Sonko said the county had identified Mwariro Market in Kariokor as a permanent place to relocate hawkers who have invaded the CBD. The market is still under construction. Last February, Sonko ordered hawkers removed from the CBC. Both the city Inspectorate department and the police tried to get rid of them, but the hawkers flooded back. They have been thronging the streets, especially from 5pm rush hour.